Big trucks! Huge stadium! Explosive fun! 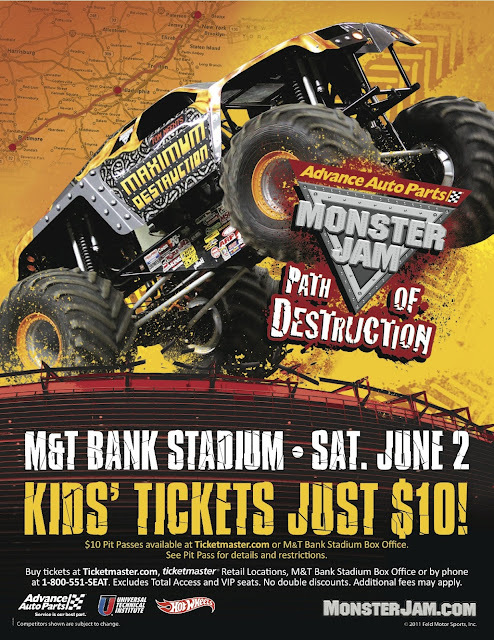 This could only spell out one thing— the Advance Auto Parts Monster Jam® Path of Destruction at M&T Stadium on June 2, 2012. We are definitely fans. Having attended several of these shows, I can say that each experience brings a different level of excitement. Last year's Advance Auto Parts Monster Jam® Havoc in the Harbor at M&T Stadium in Baltimore, MD was one of the best displays of machinery and nothing short of awesome. Maryland's own, Travis Pastrana, made an appearance and gave the crowd some nail-biting action (he didn't fare so well). Creator of chaos, Maximum Destruction driven by Tom Meents, dominates with ten Monster Jam World Finals titles. Bad to the Bone for 30 years! Grave Digger®, driven by creator Dennis Anderson, along with the Grave Digger driving team have been crushing cars and thrilling audiences all over the world. The Queen of Carnage, Madusa®, was the first female driver ever to win the freestyle competition at Monster Jam World Finals and then capturing the racing title the following year. Madusa is one of the first and only trucks to be named after its driver. PATH OF DESTRUCTION brings mega-sized action into the world of Marvel super heroes. Larger than life, Monster Jam’s web slinging Spiderman™ truck driven by Bari Musawwir will be joined by the Iron Man™ Monster Jam truck with its stealth look and glowing circuit board driven by Scott Buetow, and the indestructible Wolverine™ Monster Jam truck driven by Alex Blackwell. The fourth super hero Monster Jam truck to join the force with its red, white and blue custom body armor and shield is the First Avenger, Captain America™ driven by Chad Fortune. ***All tickets are $2 more on the day of show. Kid’s tickets are not valid on Total Access Passes or VIP seats. Additional fees may apply. *** Stop by a local Advance Auto Parts location for a $5 off adult ticket coupon. Ticketholders can purchase Pit Party passes for $10 at the box office or on Ticketmaster.com. Tickets are available at the M&T Bank Stadium Box Office, all Ticketmaster Outlets, online at www.ticketmaster.com , or by phone at (800) 551-SEAT. Feld Motor Sports, Inc. is the world leader in specialized arena and stadium-based motor sports entertainment. Feld Motor Sports, Inc. productions include Monster Jam®, Monster Energy® Supercross, AMA Arenacross Series, Nuclear Cowboyz℠, and IHRA® Nitro Jam®. Feld Motor Sports, Inc. is a division of Feld Entertainment, the world’s largest producer of live family entertainment. For more information on Feld Entertainment, visit www.feldentertainment.com . I am a Feld Family Ambassador. 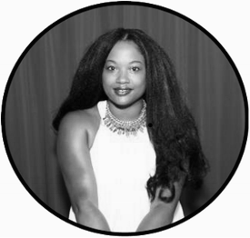 Feld Entertainment has provided me with complimentary tickets to Feld shows and opportunities to attend private Feld pre-Show events in exchange for my time and efforts, reporting my opinion within this blog and keeping my readers advised of the latest discount offers. The opinions and views are my own and do not reflect those of the sponsor.